You made a life-changing difference in 2017! This year, you provided lifesaving medical care, economic and educational empowerment, and transformational outreach in Haiti. Living, healthy, and thriving mothers, babies, and families – that’s the vision we’re able to work toward every day because of your faithful support. As 2017 comes to a close, we are celebrating the life-changing difference that your compassionate support is making in Haiti, as well as the dreams God has placed on our hearts for next year. Your compassion delivered vital prenatal care, health education, and support to more women and girls at the Heartline Maternity Center this year than in any previous years. You also invested in orphan prevention through family planning and medical support for over 1,000 materially poor Haitian women and girls. We rejoice in the hope of 110 healthy babies born in 2017! What an incredible way to celebrate the Maternity Center’s 10th anniversary! Your partnership equipped over 200 Haitian women and men with vocational skills to run small enterprises that support their families. We are so proud of the incredible dedication displayed by students – 98% passed challenging government competency exams! There are now almost 400 adults enrolled in vocational training courses at the Heartline Education Center, where they are gaining critical income-generating skills and building a more hopeful future for their families. Generous hearts partnered with the Heartline Student Sponsorship Program to give 94 children the opportunity to attend school this year. These beloved children are receiving a quality education, uniforms, supplies, nutritious meals, and the opportunity to hear how much Jesus loves them. Your kindness allowed the Discipleship and Outreach Ministry to grow by leaps and bounds over the past year as the team made 150 outreach visits to more than 450 of the most vulnerable, lonely, and impoverished residents of Port-au-Prince. Each week this incredible team has shared the Gospel through word and deed at prisons, orphanages, hospitals, and elderly homes. Their love for the Lord and His children poured out in their first ever worship album recorded in Haitian Kreyol and English! In the aftermath of Hurricane Matthew, your merciful prayers and gracious gifts went to incredible lengths to support families in building their lives back stronger and with a greater hope for the future. It is a tremendous privilege to partner with you in our shared ministry of orphan prevention and family preservation. Thank you for empowering Haitian families to keep children where they thrive – in their loving families. We gratefully pray in expectation of what God has in store for 2018. We wish you and your family a very Happy New Year! 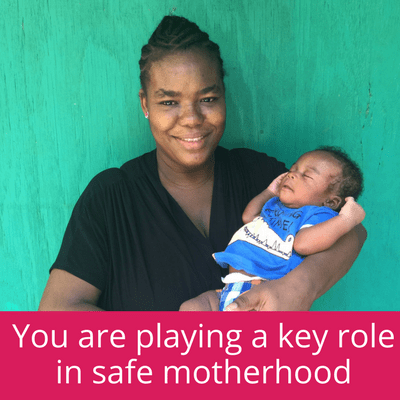 Please consider giving today to ensure that Heartline can continue providing lifesaving care and holistic support to Haitian families in 2018.